You wouldn’t know Taylor Bloom was a freshman. You wouldn’t know that he was making his fifth career start. Certainly not the way he pitched tonight. 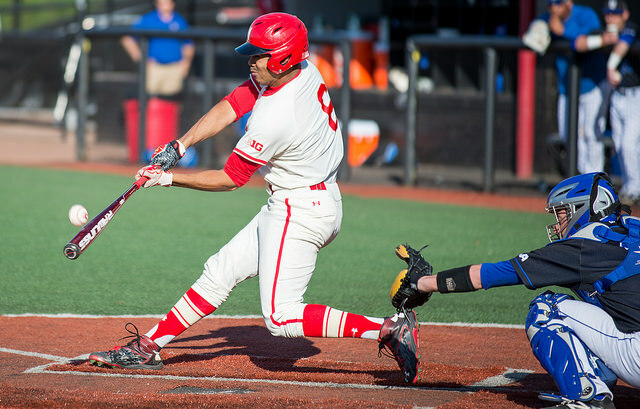 In a winner-take-all regional final, Bloom rose to the occasion, allowing just one hit, and retiring all but three batters he faced, in a 2-1 victory, to push Maryland into their second consecutive NCAA Super Regional. The freshman from Crofton, Maryland never seemed influenced by the stage. He made quick work of the Bruin lineup, throwing just 58 pitches in six plus innings of work. While he only struck out two batters, few balls were put in play with much authority. If you were wondering when the daily gem from LaMonte Wade would come, it was the top of the third when he unleashed his artillery. What looked to be a sure sacrifice fly to medium deep right-center, became another astounding outfield assist for the junior centerfielder, as Kevin Martir caught the throw on the money, blocked the plate, and applied the tag on Darrell Miller Jr. (Reggie Miller’s nephew) before leaping in the air and spiking the baseball in excitement. 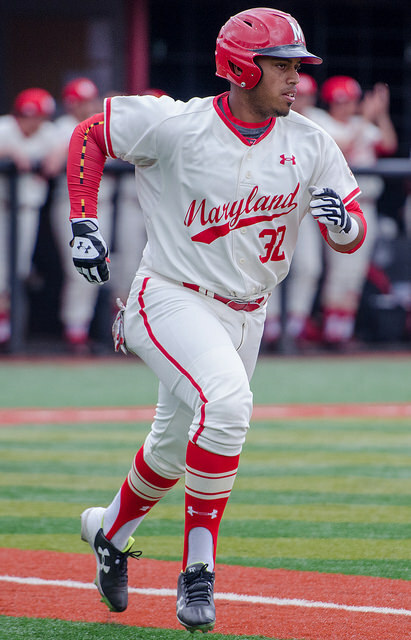 The Terps took the lead just an inning later, when Anthony Papio drove a double to the wall in right-center, to bring home Martir, who got on base with a one out walk. Martir reached base in all four plate appearances; three singles and a walk. The double by Papio was the only extra base hit of the game. Maryland tacked on one more run in the bottom of the six when Nick Cieri grounded out to second, bringing home Brandon Lowe. The critical play of the inning came earlier in the at-bat, when UCLA pitcher James Kaprielian delivered a wild pitch, allowing Martir to move up to second base. If not for the wild pitch, the groundout by Cieri would likely have resulted in an inning-ending double play. UCLA would cut the lead in half in the top of the seventh, when Kort Peterson singled home Ty Moore, who had moved into scoring position on a Brandon Lowe error. But Kevin Mooney, who relieved Bloom, would come back to strike out the next two batters and preserve the Maryland lead. Perhaps the three starts in the middle of the season proved their worth for Mooney. After escaping the seventh, he worked a 1-2-3 eighth, and then in the ninth, with Mike Shawaryn and Alex Robinson warming in the pen for insurance, Mooney quickly retired the first two batters. But a two out walk, brought the winning run to the plate, and the next batter, Peterson, jumped on a fastball and drove it to right, to give the Bruins runners at the corners, the tying run 90 feet away. After a mound visit, Belanger stuck with Mooney. On his seventh consecutive breaking ball, Mooney froze Miller Jr., and the crowd that was chanting U-C-L-A just moments prior, collectively dropped their jaws. 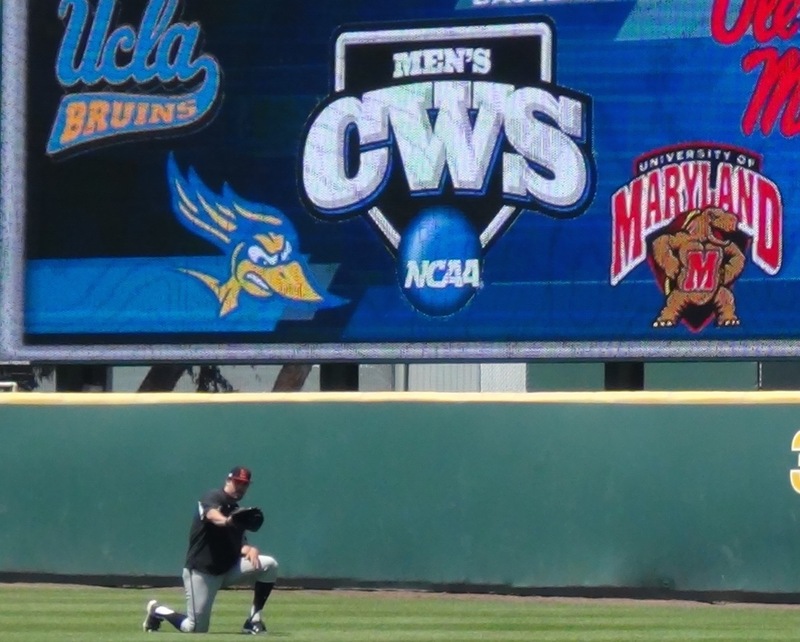 Maryland will advance to play Virginia next weekend, in Charlottesville, an opportunity for the Terps to get some revenge from a year ago, when the Wahoos ended Maryland’s season, one game shy of Omaha. On perfect evening for baseball at the beautiful Jackie Robinson Stadium, the Maryland Terrapins (40-21) defeated Ole Miss Rebels (30-27) in the first game of the Los Angeles regional, 3-1. The Terps got off to a hot start against Rebels starter Christian Trent (7-7). In the top of the first, the southpaw relinquished three consecutive doubles off the bats of Kevin Smith, Brandon Lowe and Kevin Martir, which plated two runs. Even without suspended head coach John Szefc, Maryland played their typical small ball. In the fourth inning, a squeeze by Kevin Smith extended their lead to three. Those few runs were all Mike Shawaryn (13-2) needed. The Maryland ace was good again today, although he was plagued with command issues and a tight strike zone, issuing five walks. In five and one third innings of work he allowed one run, and only surrendered two hits. The winningest pitcher in Maryland history also added to his personal accolades tonight. His nine-strikeout performance was also good enough to break Jake Stinnett’s single season strikeout record at Maryland, a record he set just last year. Maryland Baseball Network’s own John Vittas highlighted the importance of defense in this regional, and was proven correct during this game. Lowe made two sensational grabs for the Terps, stabbing a groundball up the middle and snaring a line drive out of the air to save two runs. LaMonte Wade made his own impact with the glove, robbing a homerun in the eighth inning. Austin Knight was equally as important for the Rebels, throwing out three Maryland base runners in the first four innings. This contributed to the Terrapins stranding ten runners through seven innings. By the latter innings, both bullpens had taken over the game. 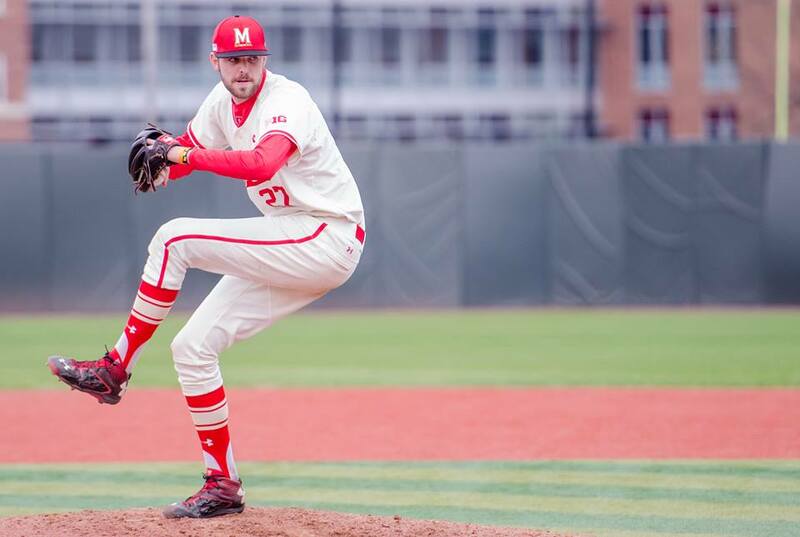 Like Rob Galligan, who limited the Ole Miss damage in the sixth, Jacob Waguespack quieted the Terps after Trent exited the game in the seventh. While Waguespack finished the game for the Rebels, Bobby Ruse threw a perfect seventh and eighth for Maryland and Kevin Mooney closed out the game with a three strikeout ninth. Maryland will face the winner of UCLA and Cal State Bakersfield tomorrow at 11:00pm EST. Maryland’s probable starter is Freshman RHP Brian Shaffer (5-1, 4.73). As always, the game will be broadcast on the Maryland Baseball Network.